Throughout evolution humans have worked to understand what life is about, why we are here, and is there a God. We have an opportunity this lifetime to exercise that inner drive to learn more about these questions and work to enlighten our minds through the quest to understand. The Wisdom in Science of Being is put into simple, practical terms to help you, and all humanity, manifest their Soul Powers here on earth. Your successes and failures in life are the result of your unification with, or opposition to, these Powers and Universal Laws, whether knowingly or unknowingly. You are the master of your own life! "BE MAN" -- Express in every act of yours All ENERGY, INTELLIGENCE, TRUTH and LOVE; thus Living only will you live; thus acting only can you build to Freedom, Strength and Happiness in Life. This is your Problem: be this your Foremost Aim. In our current stage of evolution we comprehend the Eternal and our Soul qualities in four aspects. Each aspect has its own distinct vibration: Life (the energy and power of creation), Intelligence (the perfect Mind that constitutes everything), Truth (the governing and abiding law of the known and unknown universe), and Love (the sustaining, harmonious power of attraction). Learn more about them and how to project them from your Soul into your everyday life by clicking on the FourSquare pyramid illustration. 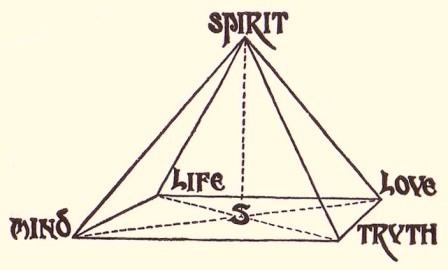 Click on the illustration of the FourSquare pyramid above to learn more about each corner: Life, Mind, Truth and Love, and the point of the pyramid: Spirit.